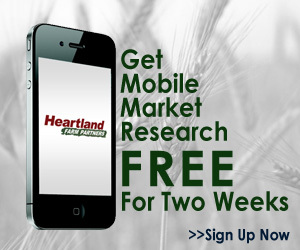 You are here: Home › Cover Crop Benefits › Higher Yields › Nitrogen from Cover Crops › Nutrient Scavenging Cover Crops – How much good are they doing? It depends. 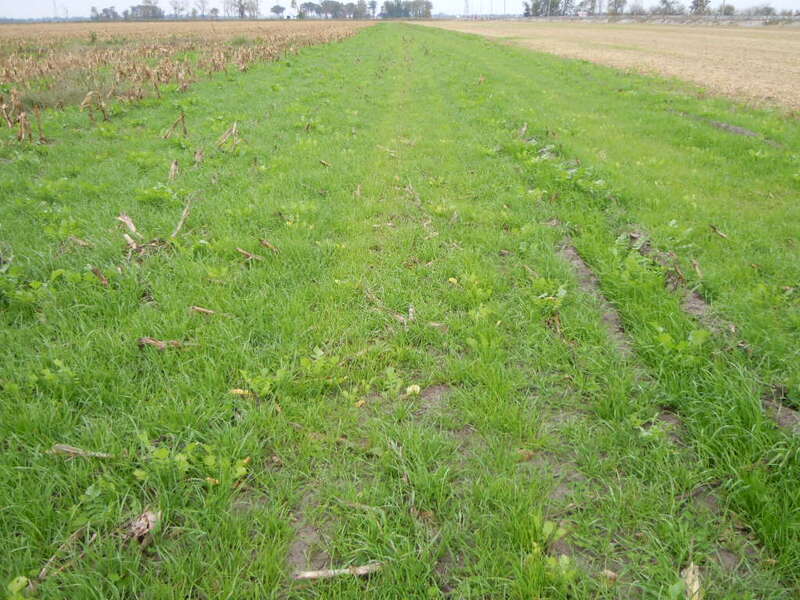 Over the years I have worked with cover crops I have recommended that producers use “scavengers” like Annual Ryegrass, turnips, cereal rye, winter barley, oats, and cover crop radishes. 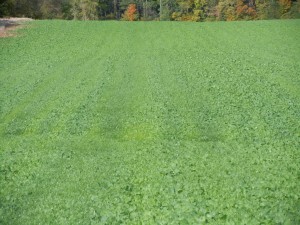 These cover crops do a very good job of capturing excess nitrogen and other nutrients and keeping them from reaching the ground water or running off with surface water. When the nutrients are scavenged they are available for the subsequent crop. Most of these scavengers are “luxury consumers” of nitrogen and a few of them are also “luxury consumers” of phosphorous. These are ideal to use on land where manure is applied. They also work very well when grown with a legume like crimson clover, hairy vetch, chickling vetch, and Austrian winter peas. However, if limited amounts of nitrogen are available how will these scavengers perform? The answer: not as well. My answer is subjective but based on observations that I will show you via some photos. It is easy to see where the manure was knifed in in this field. But how much more N is being taken up where it is darker green? We'll be doing tissue tests soon to determine that. The first observation is where hog manure was knifed in after wheat had been harvested. The photo shows that the cover crop (Annual ryegrass and Appin turnips) looks considerably darker where the manure had been applied. We will soon be taking tissue samples to see what difference there is in the amount of N, P, and K are in the plants. We also anticipate a future post showing a root pit view of the root growth difference (if any). The "yellow" strips are pretty obvious in the cover crops in this seed corn field. It is not obvious where the corn rows were but I expect the lighter strips are above where the corn row had been. The next observation comes from a seed corn field in north western Indiana near Demotte in Jasper county. The main area of difference in N uptake is found where the male corn rows had been cut out this summer after the female rows had pollinated. The difference is color was not as dramatic as it was in the previous situation but there was a clear difference in color and the amount of growth (considerably more developed) of the cover crop. The left half of this photo had 35#/acre of N but had no legume to feed the radish. 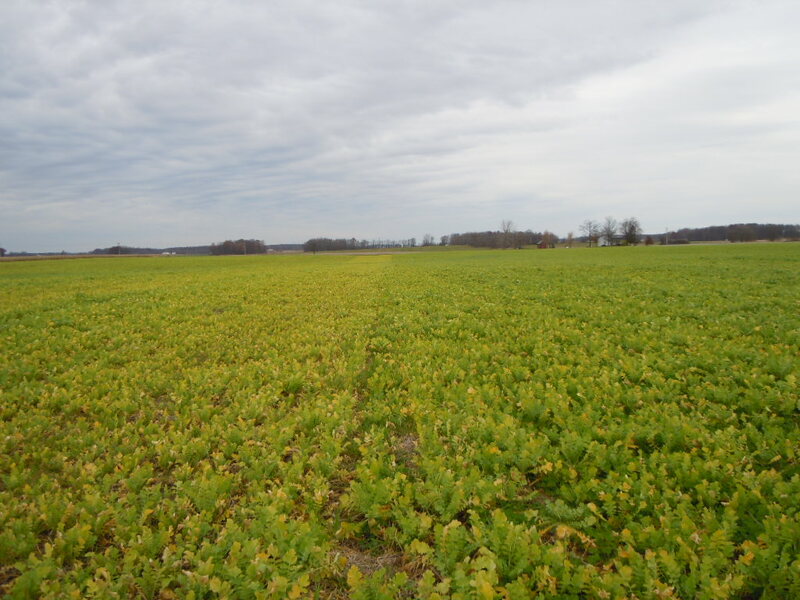 The right half of the photo shows the significant color and growth difference when radishes are grown with crimson clover (and the 35# N/acre). The next field is near Edgerton in NW Ohio. 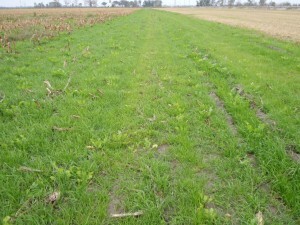 This field had three different applications being trialed. One area had a crimson clover and GroundHog radish mixture, another area had an Austrian Winter Pea and GroundHog Radish mixture. 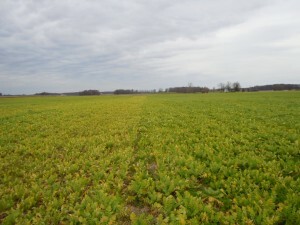 In between these mixtures was a strip of Tillage cover crop radishes with no legume but with around 35 units of nitrogen applied (the ~35 # of N was applied across the whole field). 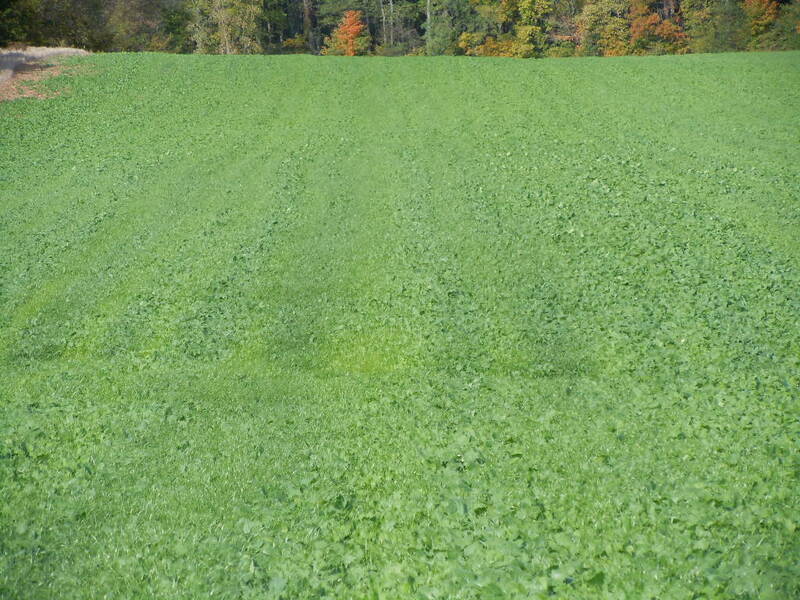 If you attend many cover crop meetings you will hear speakers tell you to apply 35-50 units of N on radishes if they are sown without a legume or without manure applied. After seeing this field I believe we are underestimating what kind of N we need to apply for “best” results as the radish only strip had considerably smaller radishes with much less tuber growth and more “yellow leaf”. The area with the crimson clover/GroundHog Radish Mix was by far the darkest green and had the largest radish growth. However, even though the peas did not look as impressive as the crimson clover, the radish growth was significant and much darker green than the radish area grown without any legume. Not only does the crimson clover add nitrogen to the soil it also greatly enhances the soil structure. 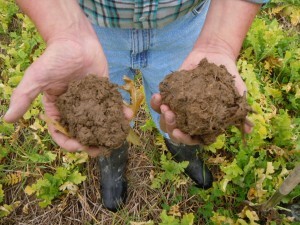 The soil on the left came from where there was only radishes planted. The soil on the right had crimson clover and radishes mixed together.